I posted a picture on Facebook of me and a young friend making glitter houses, a number of people seemed interested in how they were made so I thought I would show you. You are probably thinking this is too close to Christmas is she crazy…..but this could really be a fun project/ memory with your children, grandchildren or a special friend over vacation break. In fact in would be fun to do every year and watch how their art changes as they grow. When they leave home they will have their own Christmas village, much more valuable than any they could buy. Paint the houses what ever color you would like. I made one red and the other green since I am doing Christmas. I want it to look like snow so I painted the roof and ground white, and the chimney tan. I then add some details using a small flat brush I painted bricks on the chimney. I used a permanent ink pen to do the white around the windows. If using markers you should test to see if they will run when the glue is applied. If they do apply with a light coat of spray varnish. There are many wonderful glitters that you can use. I found this one at Michaels, it is inexpensive, the pieces are a little larger so it is easier to clean up, and it has a nice sparkle. Now the magic happens when you apply the glitter. The process is simple 1. Apply white glue, I use a sponge brush. 2. Sprinkle on glitter, I like to have mine over a paper plate. 3. Shake off excess glitter. 4. Enjoy the magic. I like to do a section at a time. For these houses I am putting wreaths on each of the windows. You can buy small wreaths, but I made mine using roping that I bought at a craft store. I wrapped the roping around the top of my glue bottle and folded the ends back to secure. After I made the wreaths I brushed a little glue over them and dipped them in glitter, shaking off excess. I then tied a ribbon over the area were I joined the wreath. I then glued them to the houses with hot glue. I also glued a small tree to the one side. Now you are ready to enjoy them. I like to put them on top of a small wreath on a pedestal, but they would look great anywhere. These two are going to be hostess gifts. You can pick and choose whichever steps you want. I have some houses I bought many years ago that are painted white and just have glitter on them. They have a little hole in the back that fits a pinch light. I am planning on doing a few more fun houses this week and will be adding more fun details on my houses. I will be posting pictures on Facebook on my Jane Allen Creates page. Click the link on the right if you would like to see what I am up to. Merry Christmas my friends, and blessings to each one of you. Wonderful, Jane! Thanks so much for taking the time to do this for us! Merry Christmas ! Thank you Penny, you and yours also have a Merry Christmas. Jane wishing you and Allen a blessed Christmas. Thank you Linda, you and yours also have a blessed Christmas. So glad you enjoyed the post, they are really fun to make and the glitter is magic. I ordered my houses online from hobby lobby, but for me they take about a week to receive. Thank you for following my blog. 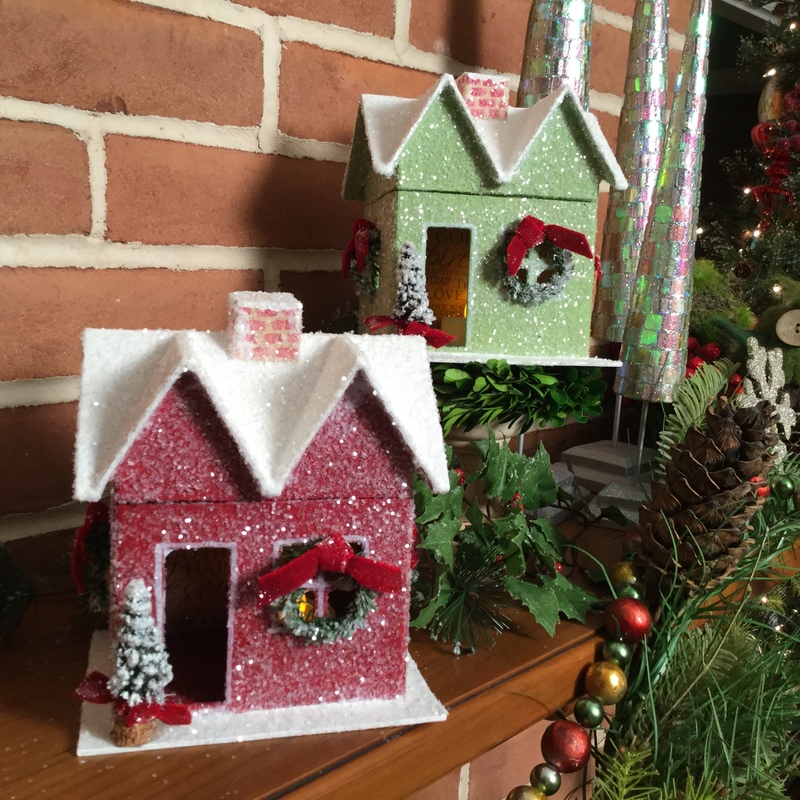 Thank you so much for the the inspiration to make these wonderful sparkling houses Jane. Sparkle on my friend……the MAGIC is happening! Thank You Lynn, you are an inspiration to so many. The joy is in the sharing! Blessings to you my friend.